Among all the accommodations nearby, there is a type that is ideal for few days’ getaways. Cheap B&B and even luxury bed and breakfast are all around Derby (Derbyshire) offering great services where breakfast is included. More for less: breakfast is included and it often is a delicious homemade meal. Apart from this, other drinks and snack are also included and parking and Wi-Fi are available for free. Moreover, sometimes the owner provides you with discounts for activities that take place in the area. An affordable bed and breakfast will provide you with more extras for less money than a hotel. Every charming room is unique and different from the other. It will you feel one of a kind. There are more space and privacy, perfect for an intimate weekend with your partner. 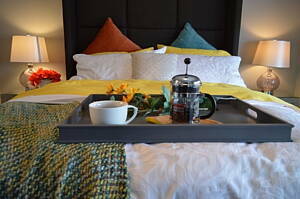 A romantic bed and breakfast is always a better choice than a hotel for you to escape with your loved one for few days. It is very nice when you get to know other travellers when booking B&B. However, there are many private bed and breakfast in Derby (Derbyshire) if that is what you prefer, as well as pet friendly bed and breakfast if you are traveling with your pet. You get personal attention either it is a cheap guest house or a B&B hotel. These are smaller than hotels and thus, better and custom attention is possible. At Infoisinfo our commitment is to work hard to show you where to find the best products and services in Derby (Derbyshire) for you and your company. We care about your comfort and that is why we want to help you to find the best accommodations in Derby (Derbyshire). We have prepared a list of the best B&B hotels and guest houses in Derby (Derbyshire). Our directory includes contact details such as phone numbers, websites, address and opening times, so it will be easy for you to get in touch and book the best bed and breakfast deals. In addition, you could have a look at valuations and bed and breakfast reviews to get a better idea about the quality of the accommodations.